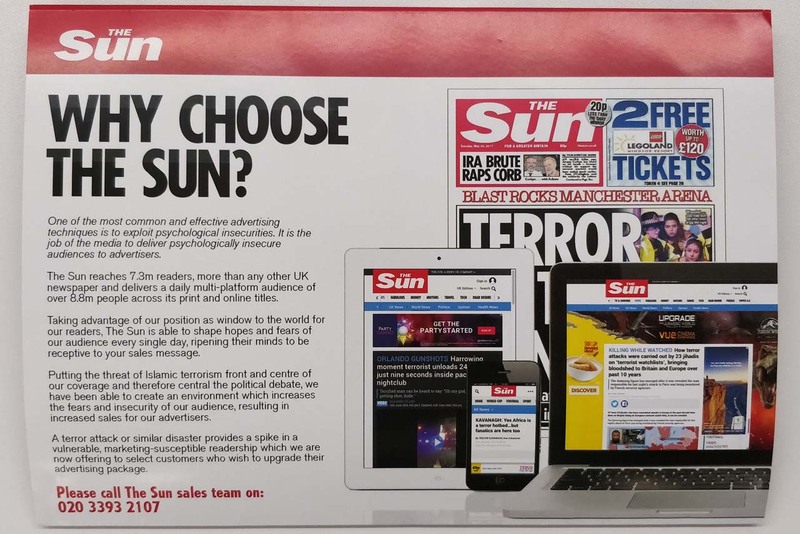 A fake "rate card" promoting The Sun's coverage of terrorism as an audience driver has been posted out to advertisers and journalists. 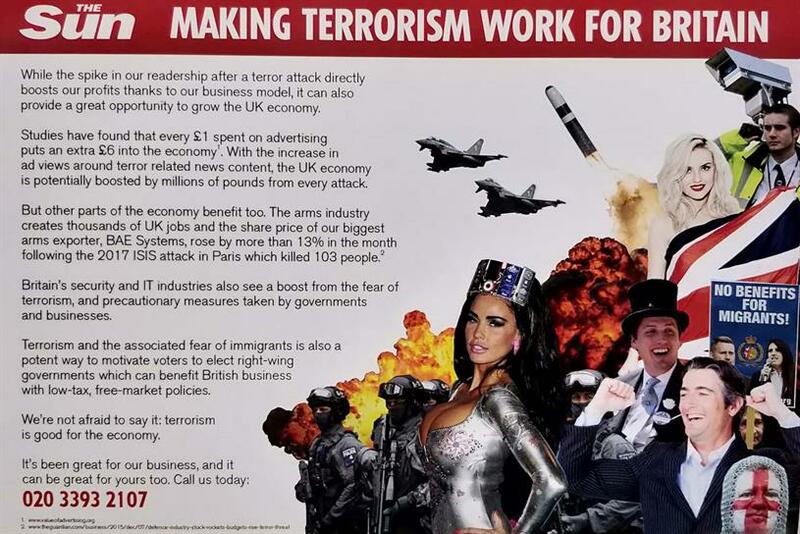 The professional-looking pamphlet was created by satirical artist and former advertising student Darren Cullen, as part of The Rapid Response Unit, an art project described as an "experimental newsroom that commissions artists to respond to news and current affairs". The faux material reads: "One of the most common and effective advertising techniques is to exploit psychological insecurities. It is the job of the media to deliver psychologically insecure audiences to advertisers." 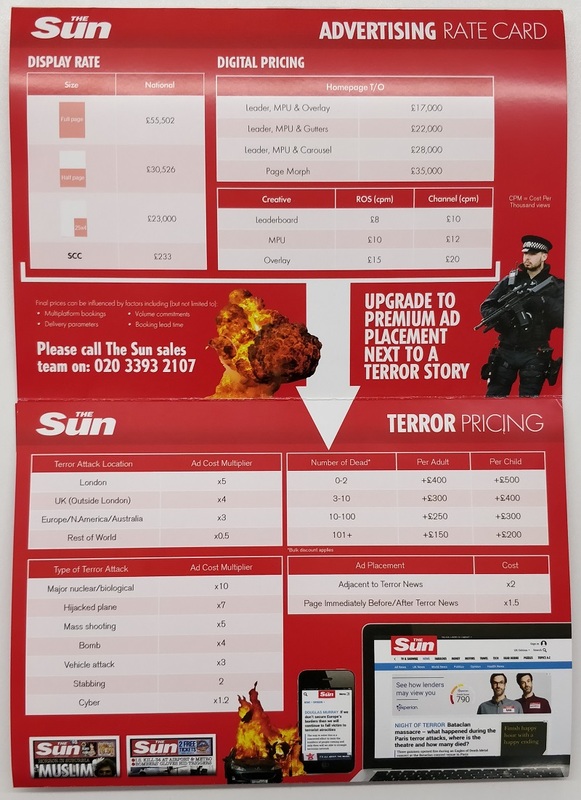 The card outlines the standard prices for advertising slots in the newspaper, followed by an additional set of prices for slots next to a terror story, with the rates broken down depending on the location of the attack and the number of people killed. Another page reads: "We know better than anyone how to write an attention-grabbing headline. Then once we’ve grabbed that attention, we hold it hostage and turn the screw until it gives us what we want. By emotionally ‘hijacking’ our readers [sic] attention we’re more able to direct them face-first into your sales funnel." 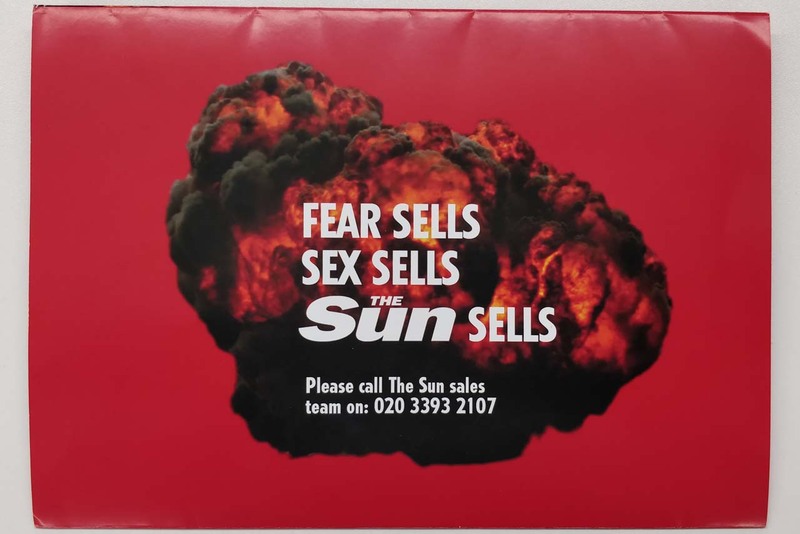 Rapid Response Unit said it had sent the card to each of The Sun’s 150 biggest advertisers. It added that a second "intervention" from Cullen, focusing on a different newsbrand, would follow on 17 August. 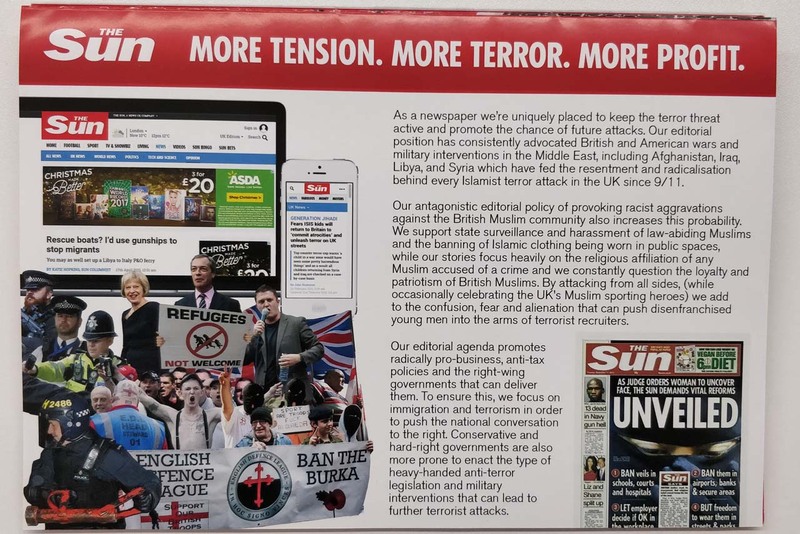 A Sun insider told Campaign that before Rapid Response Unit came forward as the responsible party, the paper had been forwarded the leaflet by a number of its advertisers to let it know that someone was making use of its brand. 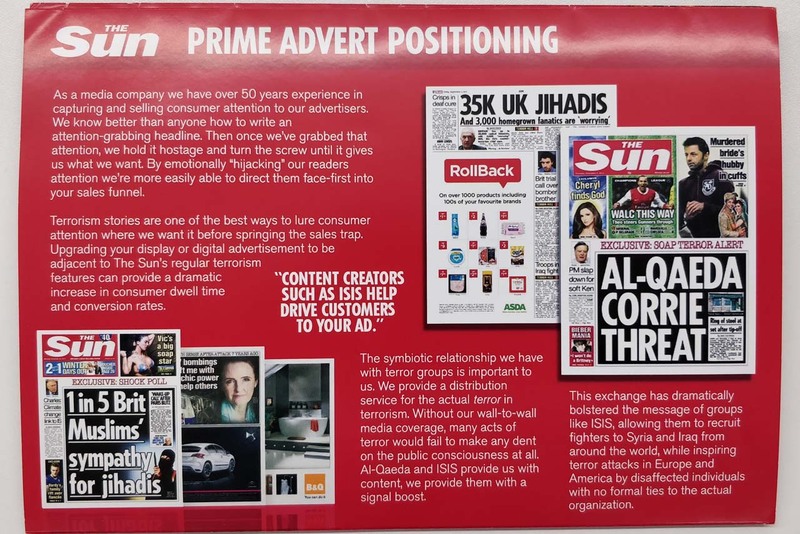 The source added that they were not concerned about the leaflet distorting the opinion of advertisers, saying: "they know who we are". "The Sun has a long history of demonising communities like the Irish in the 70s and 80s and Muslims since 9/11," Cullen said, explaining why he had chosen to target the paper. "These are deemed as suspect communities because they are thought to have some kind of latent support for terrorism. The Sun has consistently played on those fears. If terrorism is good for their business model and terrorism makes them money then we have to be suspicious of anything they say about how to combat terrorism." Rapid Response Unit is part of Liverpool 2018, a year-long cultural festival to mark a decade since the city was the second, and possibly last, in the UK to be the European Capital of Culture. The event received public funding from Liverpool City Council and Arts Council England. A spokeswoman for Arts Council England said it would only intervene with an organisation it funded if it had broken the law or breached its funding agreement or Charity Commission rules. "Freedom of expression is vitally important and we are fully supportive of artists and arts organisations pushing boundaries and presenting challenging work," she said. "It is not our role to censor the artists’ message nor to interfere in the artistic process." "Darren’s provocation is clearly designed to change the terms of debate around the tone of tabloid news presentation and the ethical decision-making processes of corporate marketing departments," Rapid Response Unit’s editor Mark Donne added. Paperchase joins the ranks of Daily Mail detractors - but is this move a suppression of free speech?